Solar Impulse is a Swiss long-range solar powered aircraft project being undertaken at the École Polytechnique Fédérale de Lausanne. 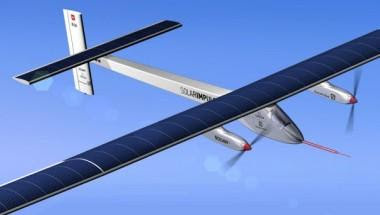 The project eventually hopes to achieve the first circumnavigation of the Earth by a piloted fixed-wing aircraft using only solar power. The project is led by Swiss psychiatrist and aeronaut Bertrand Piccard, who co-piloted the first balloon to circle the world non-stop,and Swiss businessman André Borschberg. The Solar Impulse HB-SIA in Dübendorf during its first "flea hop" test flight on 3 December 2009. The first aircraft, bearing the Swiss aircraft registration code of HB-SIA, is a single-seater monoplane, capable of taking off under its own power, and intended to remain airborne up to 36 hours.This aircraft first flew an entire diurnal solar cycle, including nearly 9 hours of night flying, in a 26-hour flight on 7–8 July 2010.Building on the experience of this prototype, a slightly larger follow-on design (HB-SIB) is planned to make a circumnavigation of the globe in 20–25 days. This flight was initially planned for 2014, but following a structural failure of the aircraft's main spar during static testing, a more likely date is 2015. Piccard initiated the Solar Impulse project in 2003. By 2009, he had assembled a multi-disciplinary team of 50 specialists from six countries, assisted by about 100 outside advisers. 2003: Feasibility study at the École Polytechnique Fédérale de Lausanne. 2004–2005: Development of the concept. 2006: Simulation of long-haul flights. 2009: First flight of prototype. 2009–11: Manned test flights with prototype. 2011–12: Construction of second prototype (HB-SIB). 2012: Multi-day missions and crossing of the Atlantic Ocean. 2013: Attempt of world tour in several stages. with the analysis you made to make this actual publish amazing. in your post is simply excellent and i can assume you're an expert on this subject. I am final, I am sorry, I far too would like to express the feeling. What's up colleagues, how is everything, and what you wish for to say about this post, in my view its genuinely awesome in favor of me.